There is no place in the US that will reward STEM (Science, Technology, Engineering, and Math) degrees more than the San Jose area when it comes to salary. However, after you factor in the astronomical cost of living here are we still #1? A recent NerdWallet study looked at the 330 largest metro areas and analyzed salaries, concentration of STEM jobs, unemployment, and average rent. The study ranked the San Jose area as #2 on the list. Who was #1? Huntsville, Alabama (what???). I don't think I would agree with how the attributes were ranked. 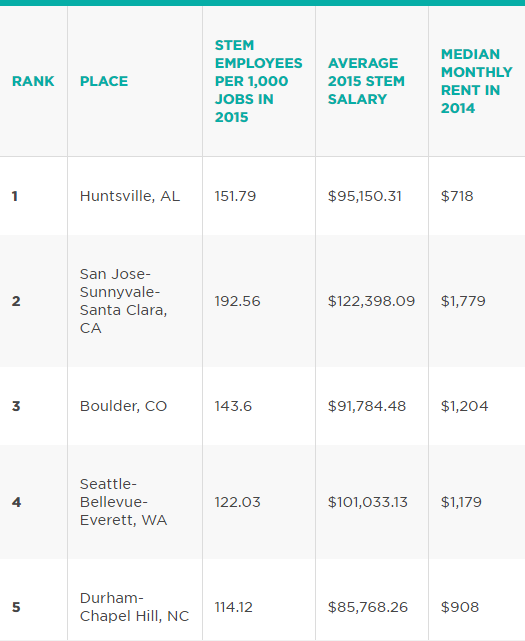 I think few people would argue against Silicon Valley being the #1 place for tech jobs despite the high cost of living. San Jose has more STEM employees per 1,000 jobs than any other metro. It has the highest income for tech employees, $122,398 versus a $84,222 average for the study (and $107,722 for San Francisco). It also has far and away the best ecosystem for tech. If you have a STEM degree here, you're likely multiple calls and LinkedIn invites from recruiters each month. For more details and the full list, hit the source link below.